The seven FIFA officials arrested Wednesday in an investigation into the organization's governing body have corrupted the international game, U.S. Attorney General Loretta Lynch said. "They corrupted the business of worldwide soccer to serve their interests and to enrich themselves," Lynch said at a news conference. "All of these defendants abused the U.S. financial system and violated U.S. law, and we intend to hold them accountable." FIFA was rocked Wednesday by the massive U.S. federal corruption indictment against current and former top officials as well as the announcement of a separate investigation by Swiss authorities into allegations connected to the awarding of the 2018 and 2022 World Cups. Authorities arrested seven FIFA officials Wednesday at a luxury Zurich hotel, where they were staying for the organization’s annual meeting. The seven face extradition to the United States. Later Wednesday, the Swiss Justice Ministry said six of the seven were fighting extradition. The Justice Department said another four individuals have already pleaded guilty in the case. FIFA President Sepp Blatter is not involved in either investigation. Lynch told reporters the U.S. was not charging Blatter "at this time." She said the investigation is ongoing and they are seeking additional defendants. Blatter, who is seeking a fifth term, has led the multibillion-dollar organization for 17 years and faces a re-election vote Friday. He released a statement Wednesday, saying: "This is a difficult time for football, the fans and for FIFA as an organization. We understand the disappointment that many have expressed and I know that the events of today will impact the way in which many people view us. "As unfortunate as these events are, it should be clear that we welcome the actions and the investigations by the U.S. and Swiss authorities and believe that it will help to reinforce measures that FIFA has already taken to root out any wrongdoing in football," the statement said. Blatter's only challenger, Jordan's Prince Ali Bin Al Hussein, released a statement Wednesday saying it was "a sad day for football." The U.S. indictment includes 47 counts against nine soccer officials and five sports media and promotions executives, covering charges of racketeering, wire fraud and money laundering, in a scheme that prosecutors said involved sports media executives paying or agreeing to pay more than $150 million in exchange for marketing rights to tournaments. The Justice Department described the alleged corruption as a "24-year scheme to enrich themselves through the corruption of international soccer." FIFA released a statement later Wednesday, saying, "We are pleased to see that the investigation is being energetically pursued for the good of football and believe that it will help to reinforce measures that FIFA has already taken." Walter De Gregorio, FIFA's director of communication and public affairs, told reporters that the corruption cases mark a "difficult moment" for FIFA, but that there will be no changes to the upcoming tournaments. "The World Cup in 2018 and 2022 will be played in Russia and Qatar," he said. Also Wednesday, agents from the FBI and the Internal Revenue Service executed search warrants in a raid at CONCACAF headquarters in Miami Beach, Florida. CONCACAF coordinates the sport in North and Central America and the Caribbean. Neither the FBI nor the IRS would comment on the U.S. investigation into corruption in soccer. No one answered the phone at CONCACAF's office in Miami Beach. In the indictment against FIFA, Lynch described "rampant, systemic and deep-rooted" corruption that "spans at least two generations of soccer officials who, as alleged, have abused their positions of trust to acquire millions of dollars in bribes and kickbacks." 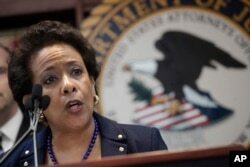 U.S. Attorney General Loretta Lynch announces an indictment against nine FIFA officials and five corporate executives for racketeering, conspiracy and corruption at a news conference, May 27, 2015, in the Brooklyn borough of New York. Lynch said the alleged corruption "has profoundly harmed a multitude of victims, from the youth leagues and developing countries that should benefit from the revenue generated by the commercial rights these organizations hold, to the fans at home and throughout the world whose support for the game makes those rights valuable." U.S. prosecutors also said they uncovered a dozen different schemes while investigating corruption at FIFA – and some of those schemes involved the awarding of the 2010 World Cup to South Africa. Acting Brooklyn U.S. Attorney Kelly Currie said nine of the schemes involved sports-marketing companies seeking a piece of the lucrative business surrounding FIFA events. He said corrupt FIFA officials solicited bribes from sports marketing companies, which often made tens of millions in profits from soccer tournaments such as the World Cup. Currie said U.S. officials want "to send a message around the world that this behavior will not be tolerated." James Comey, the director of the Federal Bureau of Investigation, said, “As charged in the indictment, the defendants fostered a culture of corruption and greed that created an uneven playing field for the biggest sport in the world." In the Swiss case, federal prosecutors said they opened criminal proceedings against a group of individuals suspected of mismanagement and money laundering in connection with awarding the 2018 World Cup to Russia and the 2022 tournament to Qatar. FIFA's ethics committee investigated similar allegations, and concluded in November that there were only "limited" ethics breaches and not sufficient evidence of bribery in awarding the tournaments. Those charged in the U.S. case include five corporate executives along with current FIFA Vice Presidents Jeffrey Webb and Eugenio Figueredo; former vice president Jack Warner; executive committee member-elect Eduardo Li and former committee member Nicolas Leoz; development officer Julio Rocha; Olympic tournament organizing committee member Jose Maria Marin; CONCACAF president attache Costas Takkas; and South American football federation president Rafael Esquivel. Daryll Warn and Daryan Warner, sons of Jack Warner, are among those who have already entered guilty pleas along with Charles Blazer, former CONCACAF general secretary, and Jose Hawilla, founder of the Brazilian sports media company Traffic Group. In addition to the allegations involving sports marketing bribes, the indictment includes alleged schemes related to bribes and kickbacks related to the Brazilian national soccer federation's sponsorship by a U.S. sportswear company, the selection of the 2010 World Cup host and the 2011 FIFA presidential election. Some material for this report came from AFP, Reuters and AP.